It's clear, those looking for a smartwatch aren't going to buy a Casio Edifice 501, however, for those who want a classic time-telling watch with the added Bluetooth functionality offered by a paired smartphone, the Casio is a great option. Rather than be an attention-hogging notification machine, the Edifice 501 does what all watches should do, and thanks to the smartphone app, does it more accurately, and that's just telling the time. Smartwatches are here to stay, but for some, they're an unnecessary annoyance. Constant bleeping, notifications and attention-grabbing might be your idea of a nightmare. However, it is possible to have a regular analogue watch that uses a smartphone's smarts to keep it in time accurately. 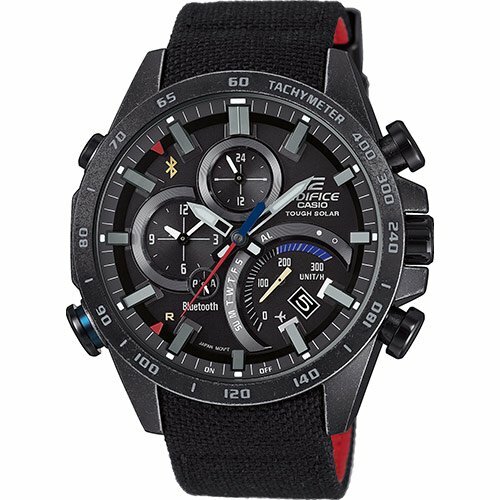 Enter the latest Casio Edifice lineup. From the outside, they look like ordinary watches, but they're far from it. Using an app on your phone, they're versatile, accurate and can change timezones. From the outside, the Casio watch looks like your classic but modern chronograph. There are various design options, with different colour faces, accents and frames as well as a variety in strap material and styles. The model we got our hands on was the all metal, silver and red version. With this model, the watch face is a deep grey with splashes of red and shiny silver accents elsewhere. As with most chunky all-metal watches, the Casio has a reassuring heft to it. You can definitely tell when it's on your wrist, which will either be a big draw for you, or a major turn-off. Of course, all this total 199 grams in weight means it's built from a substantial material. In this case, that's the usual stainless steel casing and metal link band which is equipped with the familiar easy release three-fold clasp. The face is coated in mineral glass. Control wise, we're looking at five buttons/crowns; three on the right edge and two on the left. The middle crown - as usual - rotates, while all the others are push buttons for the usual chronograph features. Whether you're starting a timer, pairing the phone or changing the time, all the controls will feel familiar to the traditional watch wearing crowd. All this is packed into a watch that's also sealed up to 100 meters in water. In short, it's built to last, but in a style which will go well with business attire. The 501 follows on from its predecessor, the 500. Rather than use a smartphone connection to collate fitness tracking information, or buzz when you get a new WhatsApp message from that group you forgot to leave, the Casio mostly uses your iPhone to stay in time. By using your phone's internet connection, it checks that it's showing the right time four times per day, and adjusts to ensure that it's always as accurate as it can be. What's more, if you happen to be travelling to a different time zone, you can manually just push a button to change it to match the automatically adjusted time on your phone. You can also use the Casio app on Android or iPhone to set World Clocks, and have the time in one of 300 foreign cities displayed on one of the physical complications on the watch face. One of the added benefits of being more old-school watch than smartwatch is the battery life. Analogue watches last years, but the solar powered Edifice 501 can go on forever. Its so-called Tough Solar converst both sunlight and light from other sources into power. Presuming this doesn't go faulty, that gives you a battery that never needs changing or recharging. If you're someone who doesn't wear the same watch every day, you may worry about the battery dying when you leave the watch packed away. Thankfully, Casio has built in a neat battery-saving feature. When it's in darkness, the hands stop moving to conserve energy, waiting until it detects daylight again. With this power saving function switched on, it can last almost three years in the darkness. Without the power saving function on, it can still go eight months before needing to be brought into the light. Despite the long battery life, there's still a low battery alert.